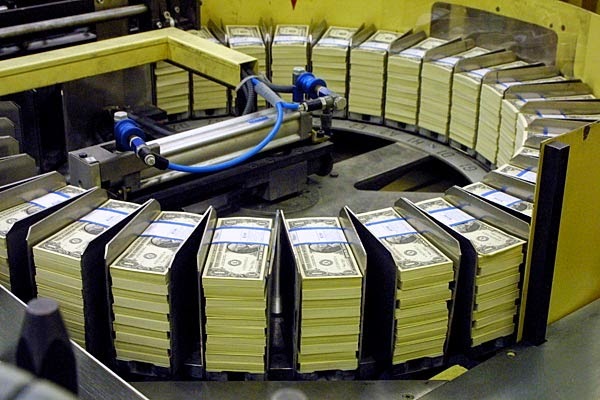 One of the biggest illusions in contemporary society, that are satisfied for to control the masses, is the money. The money seems to have concrete reality just because they help us to make easier exchanges of products or services between us. The carpenter makes a cupboard for the plumber, and gets in return a certain amount of money that the plumber also took from someone else to whom has made a service. In this economic circuit there is not necessarily the money itself that circulates, but the product or service offered in return. That amount of money is an abstraction for the cupboard work that the plumber previously did, and the cupboard - money exchange is a fair play exchange at this level. Globally, returning a service for money is actually a behavior sustained by a very diverse spectrum of products and services exchanges that community members do to each other to mutually improve their lives. Mutual exchange of services is a compromise that nature has found longer before the human species existence. Living in the community was possible due to this type of collaboration between group members. For example, the mammoths’ hunting was made with the community participation, where each member has a certain role in the final success. If we go back on the evolutionary scale, and analyze the lions group hunting on elephants, we see something similar: some individuals specialize on a certain task in the group: one climbs on the elephant’s back biting the neck, other bites trunk, another one bites the belly, etc. With courage and mutual trust, the lions pride can hunt much larger animals than each of the group members, individually. The human species, however, the team collaboration had first turned into prey-predator relationship type (as the classical society) or deception (as the civilized society). The money is the tool of this deception relationship. The physical money itself is nothing without a proper potential capital. It is a mistake to believe, as Marx and many economists after him did, that money consists in concrete capital, in material resources only. The true strength of capital lies in... "human resources". The concrete capital itself needs "human resources" to evaluate it and pay for it. An animal will choose to eat 100 grams of food instead of 100 grams of one million dollars equivalent paper. Unfortunately, the human resources "education" to equate a good in money is not always a sign of human versus animal species superiority but, often, it is the sign of slavery "brutalization". Sometimes this equivalence overflows the education area. Hundreds of tons of gold brought from Southern American colonies failed to save the Spanish empire from collapse. That happened because the potential capital was very low at that time. The members of Spanish society and Europe itself did not want to exchange the Spanish crown gold with vital products. So, the money does not exist like a heap of certain and concrete objects that are ulterior distributed to citizens just like the hunting members split the prey after putting it down. The country budget or the bigger economic area budget does not have a fixed amount. Although, originally, the money was a commercial unit, today they turned into something else. The money is those illusions that keep some citizens in poverty. They are the most slaves among the slaves. If they wouldn’t be kept in poverty, they wouldn’t be "voluntarily" slaves any longer. Without poor there can be no prosperity in society today. The welfare is not sure with tons of gold or food or luxury car excess, but with hungry slave that want these things. There is no relief of having this things unless there is no guard at the gate, house maid, plumber, garbage man and others like them to serve. These people are kept in poverty in order to be persuaded to serve by the new slave owners with the promise of fulfillment of their ideals. Without these promises they would no longer be "willingly" slaves and the system would be forced to return to classic slavery of death threatening, prison and many other tools of conviction. Therefore, the social system will need poor further on. It is well-known that the food overproduction is generally destroyed in the western rich countries. Officially, it is said that such a ridiculous behavior is due to the interest of maintaining high price for those products. But, in fact, some people should be kept hungry and frustrated because, in exchange for food and a certain dose of polished pride, they will accept employment in a certain hierarchy and, thus, they will accept the superiors’s orders. The currency value is not fixed only by the commercial trading and the currency exchanging one to another. The free market is just one of the factors of this value determination. The other one is the state intervention on the money supply. When suicides multiply or when there is acute complaints from a particular social category, the system throw the money supply in the market to delude the naive ones and deceive them with such a false wealth or economic growth. The promisees of a better life are one of the tools through which the potential riots are kept in control. Polling institutes are the direct application of sociology science in the concrete social field; they measure the citizens’ dissatisfaction state. Voting representative politicians is only part of this gearing; for these institutions does not matter the masses option for one politician / party or another but, especially, the masses mood to be deluded to new promises. The absenteeism from voting raises concerns about the lack of enthusiasm of slaves to engage in general support of the economy. It is well-known that when the demand is high then prices rise accordingly. This means that the same product will cost more money and so it takes more money supply. The main state bank prints then these papers that will cover this need for purchasing. This is the monetary flood phase. The ratio between supply and demand regulates not only the prices but also the quantity of money supply launch on the market by the state’s official bank. There will be monetary flood as long as there is willing to work and enthusiasm in the potential capital field; printing the money supply is made only by anticipating the overproduction that follows its usage. When printing supplies are made there is no actual coverage in concrete capital for the new amount of money. But after the operation of converting this naive people’s enthusiasm into profit, and transforming it into apathy, a part of the money supply is withdrawn out of the market in order to prevent inflation. This is the monetary withdrawal phase. The money supply flood and withdrawal that the state bank does is determined by the simple people’s availability to sell their freedom, and to become potential capital. These phases represent the two critical moments for the modern slavery, namely the luring and the profit. This strategy is identical to the fishery; after fishing with baits, the fish has adapted and learned to refuse: the fisherman went further on with the deception and introduced the bait in advance. Throwing the bait in the water where the fish lives (circumspect toward the hook) a few days before throwing the rod, creates a sort of food harassment and, at one certain point, it will go for the bait at risk, unable to resist temptation on the long term. Basically, the time that fisherman looses waiting for the fish to bite happens right now: the fish will bite the bait increasingly relaxed, as there is no hook. But, at some point, there will be a rod hook. Eventually, the fish knows that it might die, being hooked by the fisherman rod but it can not help itself anymore not to bite. The biting refusal makes a real psychological withdrawal, just as happens with psychoactive substance addiction. The money and shopping addiction is the contemporary slavery psychodynamical bait. Buying various products from the corporations, government and the system in general actually is pumping capital into them, thus opening the monetary flood phase. These, on their turn, attract the staff, the human resources and become increasingly larger. At the monetary flood phase the jobs are diverse and comfortable. The ratio between the stress / volume of work and received payment is very favorable for the employee. The employee’s self confidence and self-esteem increases so that it can afford to change jobs and negotiate better conditions. At this moment, the worker or employee mentality is full of boom and enthusiasm, almost reaching hedonism. But this is an illusion, a lure that social system throws through the corporations just like the fisherman previously throws the bait before throwing the hook. The slave is easily lured to lead a life of ease, to "afford" buy all kind of things, vacations, holydays and other such luxuries that are gradually fixed in its mind as normal things and not as luxuries. Basically, the illusion that these dispensable goods would be actually indispensable is generated. Given the fact that these things gradually come to occupy a place in the subject’s biography, she or he becomes addicted to them. This is the moment of luring and testing in order to select those who are willing to work in some kind of unfavorable conditions, which is the next step, the profit. Like fish in the water, the potential slaves are discreetly seduced into this first hedonistic period and they are encouraged to have a somewhat higher lifestyle because, eventually, this lifestyle maintaining would be paid with a much higher work volume than originally agreed. For “high lifestyle” slave-dependent the real payment for this luxury comes only after the monetary withdrawal period is released. Here we're talking about a real scam that the social system and private employer practice in order to lead the employee inside the profit area. The money supply withdrawal from the market involves massive loosing jobs, which causes economic recession. Recent history has cyclically evolved with a few years of economic booms followed by other years of recessions. These steps are identical to the ebb and flow of money. But firings do not involve the reducing production accordingly. Simply, the employee has to make the colleague fired work. The conservative minds will not give up these little delights that had had become part of their lives and will accept the new conditions of work. Here is how the monetary system works exactly just like a commercial, using consumer subtle manipulation. This is actually the point that the system was intended to reach from the very beginning. The initial ratio between stress/work volume and payment was a fake during the monetary flood. The real ratio is exactly this final one. In this period there are paid the financial “loans” that some employees have subconsciously contracted, unaware of this turning situation when have committed. The fine and easy jobs during monetary flood were that kind of bait meant to attract the potential slaves into the general economy and, subsequently, to gradually “tighten the belt” so that the employer will get the profit at one certain time. Some monetary flood employees become unemployed at monetary withdrawal. They wake up sometimes in the situation of being unable to continue and end up being thrown out in the street. The social protests explode. Then the state invests then in “law enforcement” to keep angry people under control. The street battles that follow for possible, the riot police use tear gas, rubber bullets, dogs, electroshock batons, mobile phone surveillance by intelligence services and others. The official media is ready to create in the public’s eyes an anarchist image, hungry for destruction, for these people. Thus, their image is compromised. The riots important figures are carefully monitored and socially marginalized. Despite stories about freedom of expression, in many “civilized” countries the sympathy for the ideas of revolt is paid with the impossibility of finding work after the “intelligence suggestion”. Meanwhile, the consumerism and generally mass culture industry develops a new generation of slaves, luring young generations with its illusions. The dramatic stories of street protesters are masked by talk shows and entertainment that viewers unconsciously think are part of, dreaming on the illusions of celebrity and social standards enlargement. Blinded by their “dream”, they will fall too into the same trap few years later, with the next economic recession. Just like a huge slaughterhouse, the social system extracts the young generations enthusiasm, turning them into a sort of lonely, depressed and bizarre zombies. The interesting part of such socio-economic maneuvers is that this type of slavery has the form of freely consented exchanging values. But some of those who accept this are simply deceived either because they can not know the value of the product they exchange for their work, or because the value of that product is just an illusion and nothing else. As concerning money we deal with a deceiving exchange of values: the system provides sheets of paper with celebrities pictures printed on them in return for a certain service or product. Therefore the contemporary slavery can be called, without any risk of error, “the disproportionate exchange slavery”. The culture of hedonistic consumption that the system constantly hit slave’s mind with is actually an urge to disproportionate exchanging meant to bring profit for its occult forces. Creating artificial threats to citizens or harassing small farmers, as happens in the US (see the Monsanto case), is aiming to persuade them to leave their traditional (independent) lifestyle and make them move as a (dependent) slaves in urban areas. Supporting social conflicts or other socio-economic maneuvers, in the nearby areas, is a rich source of immigrants, from whom there are these profitable workers are recruited, as we have shown here: http://baldovinconcept.blogspot.ro/2010/03/razboiul-cea-mai-profitabila-afacere.html . Turning the simple and normal human being into potential capital is the absolute essence of the contemporary halfslavery state economy. The production itself it does not matter, but the potentiality to “willingly” attract as many naive people in the new masters organized and controlled work field. The new masters’ main interest is to have slaves specialized in very diverse areas, as different as possible from the personal purchase of food and home. Then, the price for getting these from the system will be the very slavery that a slave accepts, in the absence of knowledge about independence. Such a subtle subterfuge allowed lowering the voice of Christian priests, who - what else could they do? – kept telling for centuries that the classical slavery is a sin, but they practiced it with penitence ... If this freedom of choice would be respected indeed, then there the social system would not be a slavery but a authentic freedom as the players places in a football team. But when this freedom is influenced by the manipulation or control auxiliary actions, then the freedom is vanishing.